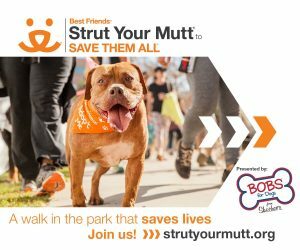 Strut Your Mutt, a fun dog walk and fundraising event, brings together thousands of passionate people from all across the country to raise money to save the lives of homeless pets. Participants can choose to raise money for Best Friends or for one of hundreds of participating shelters, rescue groups and other animal welfare groups. No matter who you choose to support, the organization you raise funds for gets to keep every dollar you raise. When we strut together, we can Save Them All.